Love Lock Pendant is a unique and creative way to express your love and commitment. Love Lock Pendant is inspired by the padlocks that couples place on fences, gates of monuments or bridges to symbolize their everlasting love and the key is usually thrown away. Now we see love locks in many cities around the world like Paris, Rome, Florence, Prague, Cologne and many more. Lock pendants are supposed to have originated in China where silver locks were worn as pendants to ward off evil, bring a person good luck, fortune and long life. It was also given to newborns to lock them with long life. Make one or several pendants and wear it from a chain. It is perfect as a charm hanging from a bracelet too! Spread some love by giving this super cute and colorful pendant to someone special! Techniques: Peyote, ladder stitch. Size: 1 ½” by ¾” approximately. Suitable for beaders familiar with peyote stitch. Tutorial includes several clear digital illustrations and photos with text in English to make beading this delightful pendant a breeze! Tutorial also includes 3 addtional pattern variations for peyote strip for lock. Possibilites are endless. 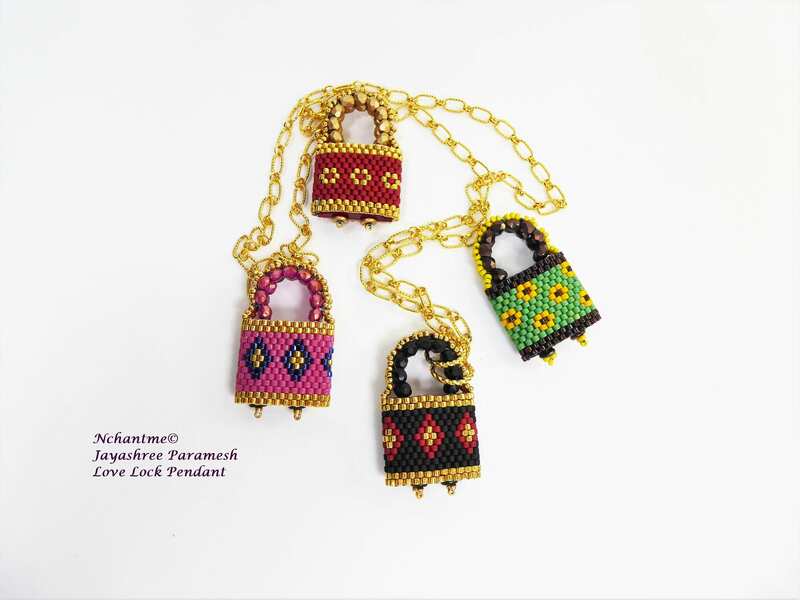 To make one Love Lock Pendant you will need 2 Carrier Beads 17x9x5mm in size, a few colors of delica beads, and little bits of other easy to find materials.